The amount of this marker protein in the cell culture supernatant is determined by ELISA. It can be used to monitor the efficiency of differentiation of endodermal cells from ES/iPS cells. Since this kit is designed for the 96-well microplate format, it is suitable for multiple sample measurements, such as screening of inducers for differentiation or an optimization of culture conditions. This product was developed by a collaborative work between Institute of Molecular Embryology and Genetics, Kumamoto University and Dojindo Laboratories. 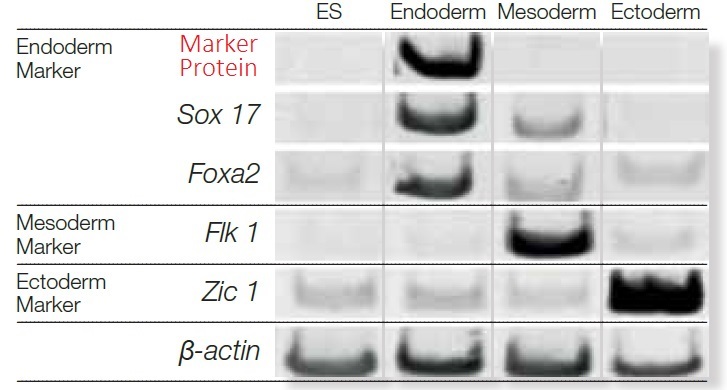 The secretory protein has a good correlation with Sox 17 and Foxa2 which are commonly used proteins as markers of endoderm differentiation. Most of the Foxa2 positive cells are co-stained with the marker protein. The three images in the upper row were obtained from conventional ICC analysis. 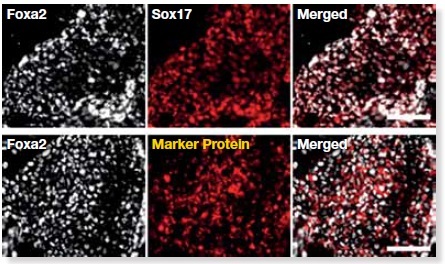 Normally, Foxa2 and Sox17 double positive cells are defined as differentiated into endodermal cells. Human iPS 253G1 cells were differentiated into the definitive endoderm. They were being monitored with ELISA assay to measure the amount of marker protein secreted or ICC analysis for Sox17 and Foxa2 double positive cells. 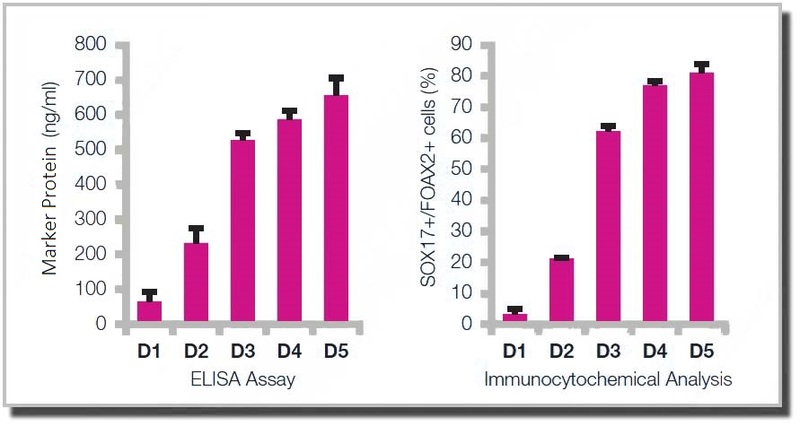 The two bar graphs show the correlation of the amount of secreted protein with the amount of Sox17 and Foxa2 double positive cells from day 1 to day 5 (D1 to D5) of differentiation.